Annette and I recently returned from a vacation trip to Cape Cod and Maine. It was a great trip. Maine, to us, was a very relaxing place, even though Annette was involved in a Photography Workshop, which had her rising way before sunrise! The first part of the week was beautiful weather, by conventional standards. The skies were blue. The sun was shining. The temperatures were in the upper 60’s F.
The latter part of the week was dreary, by conventional standards. 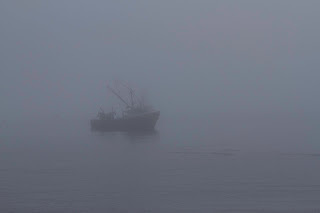 Foggy, overcast skies were the norm. Yet both conditions were great for our photography. Let’s start with the fog. 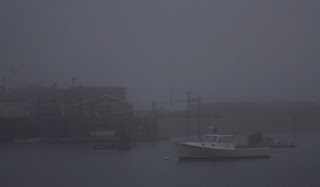 For photographers, fog is an eraser. It erases (hides) a lot of background clutter. Fog is a soft box creating wonderful soft lighting without the harsh contrast and shadows of bright, mid-day sun. 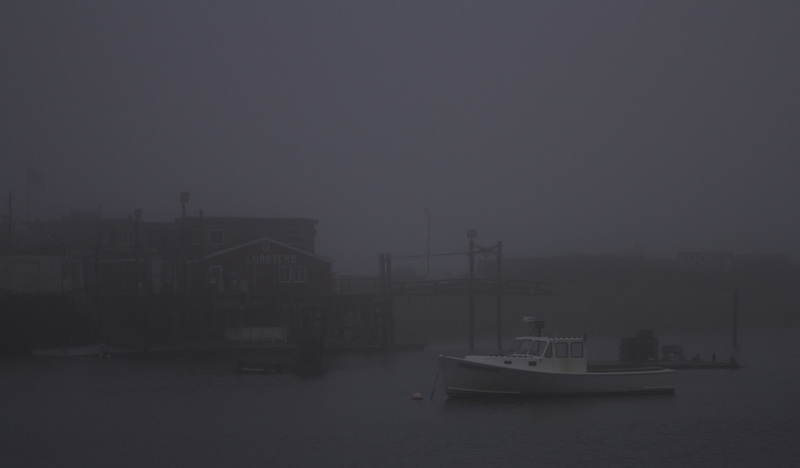 Fog sets a mood. Sometimes it is a dreary, melancholy mood. Sometimes it is a mysterious, threatening mood. Here are a couple of pictures from the trip where fog played an integral part of the image. 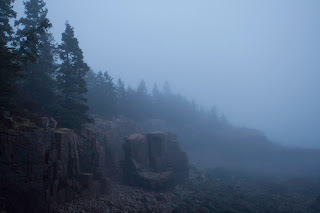 The above image is a view of the coast line, at least as far as you can see with the fog! 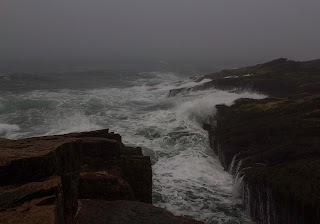 These are the waves near Thunder Hole. 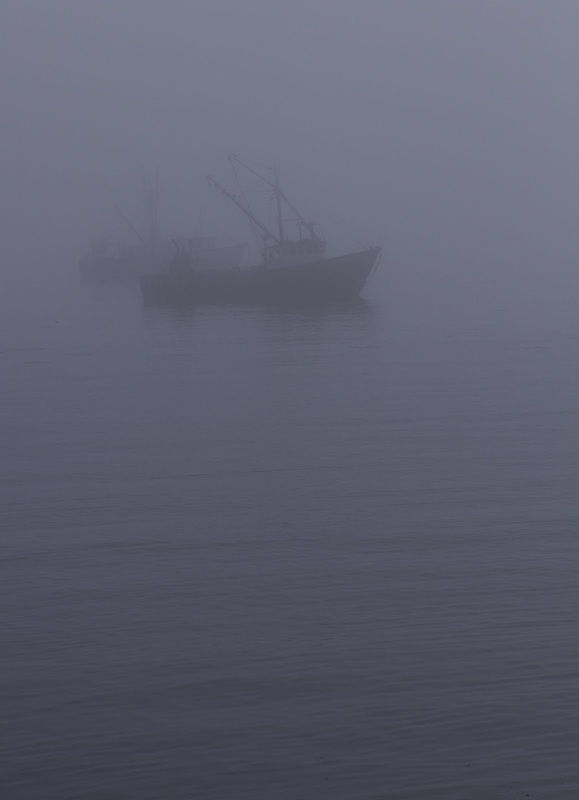 The fog hides anything in the background, whether it is a ship on the water or more rocky shore. This picture and the next show how much the fog obscures anything around the boat. They were taken in Bar Harbor from the area where the tour boats take on passengers. Early morning fog. The boat was only 100 yards from where I stood. One other lesson: When we drove past this cove the first time, there was fog in the distance, but the whole cove was visible. But we didn’t stop. Instead, we drove a mile or so past it, took some pictures and came back. Then it looked like this. So…Take the picture when you see it! Don’t assume it will still be there when you come back!